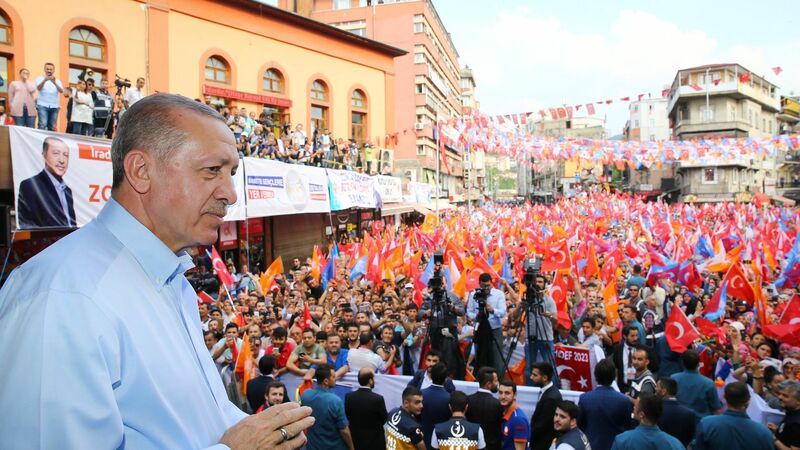 Earlier this spring, Turkish President Recep Tayyip Erdogan made a big bet on timing — moving up his country’s general elections by 16 months to June 24, he reasoned, would make it easier to lock in a fresh mandate before a slowing economy and growing opposition complicated things. Why it matters: Given his broad influence over the media and the courts, as well as the emergency decrees that he’s used since a failed 2016 coup to silence or marginalize opposition figures, Erdogan and his AKP party, who’ve been in power since 2003, are still the electoral favorites. But this election’s not quite the shoo-in that it might once have seemed. The international creditors who’ve helped fuel Turkey’s economic boom don’t like the country’s rising inflation. But the central bank has long been under pressure from Erdogan to keep interest rates low to benefit the small businesses that make up a key part of his political base. Investors’ patience for Erdogan’s meddling has started to fray recently. At the same time, Turkey’s beleaguered opposition has been surprisingly unified. Large and small parties have joined together to increase their chances of gaining seats in parliament, and the leading presidential challengers, the fiery nationalist Meral Aksener and Muharrem Ince, a largely secular politician of humble origins who has made inroads with Erdogan’s base, have pledged to support each other if either makes it to a second round against Erdogan. That could pose a stiff challenge for him. Go deeper: The year of the strongman.